Congress has authorized four retired pay plans. Below you will find a brief explanation of each plan. Although each retirement plan is unique, the service dates that must be used in the retired pay computations remain the same. Primary service dates used include the Date of Initial Entry into Military Service (DIEMS) and Title 10, United States Code, Section 1405 service date (1405 service). For complete details, see Understanding Military Retirement Pay. 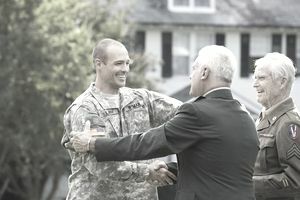 The DIEMS date is a fixed date and is not subject to adjustment because of a break in service and it is used to determine which of the retirement plans military members fall under. You get 40% of your base pay after 20 years. In addition, you get a bonus at 12 years of 2.5% of your annual base pay. Your multiplier for each year of service is 2%. You can continue to increase your retirement rate above 100%, which would be achieved at 40 years of service. You earn matching funds into your TSP account from the government. You can't draw your retirement until you are 60 to 65 years of age. You can roll it into a private retirement account. You can take your retirement money with you if you leave service prior to the 20-year mark. You also have a choice to join the Blended Retirement System if you entered service between December 31, 2005, and January 1, 2018, or to remain enrolled in the CBS/REDUX system. With continued service, you add on to a maximum of 100% at 40 years of service. The cost of living adjustment is the Consumer Price Index minus one percent until age 62 when it is readjusted. CBS/REDUX system requires a choice at your fifteenth year. You can take a $30,000 cash bonus, which is about $21,000 after taxes and your pension check will be 40 percent when you retire with 20 years of service. You can elect the High 36 retirement system with no bonus and a 50 percent retirement check when you retire with 20 years of service. There is no bonus or readjustment. Cost of living increases is based on the Consumer Price Index. With the Final Pay system, there is no bonus or readjustment. Cost of living increases are based on the Consumer Price Index.